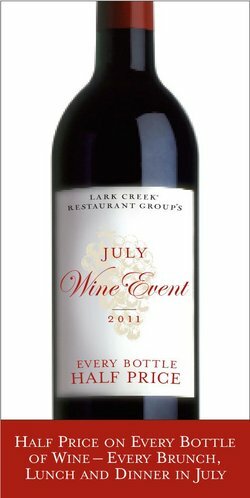 Starting July 1st, the ~LARK CREEK RESTAURANT GROUP~ will be offering half-price bottles of wine during brunch, lunch, and dinner service at all their restaurants through the month of July. Restaurants include Fish Story, The Tavern at Lark Creek, LarkCreekSteak, Lark Creek Walnut Creek, One Market Restaurant, the new Cupola Pizzeria, Yankee Pier (locations in Larkspur, Lafayette, and Santana Row in San Jose), and Parcel 104 at the Santa Clara Marriott (Friday evenings only). Through Thursday June 30th, ~CREDO~’s dinner guests can each exchange six corks for a glass of wine (limit one per customer). The restaurant is trying to encourage cork recycling by partnering with the National Resources Defense Council. The corks Credo collects will be recycled through ReCork. For more information on cork recycling, please visit 100percentcork.org. And as the ~HIDDEN VINE~ nears its closure on July 9th, the current owners will be offering all bottles of wine at 20% off from July 7th-July 9th, 5pm-2am. The Hidden Vine’s new location in the Financial District—slated to open in September—will feature a more extensive wine and food program, a wine club, private room, and outdoor bocce court. 620 Post St. at Taylor; entrance on Cosmo Pl.